Oh Ara, you look so thrilled to be here right now. "I'm going to LOSE MY MIND watching this." "I doubt that. I really do." She paused. "So. Many. Dancing. Bunnies. Who leaves their kids with these people? I mean... and why are they all dancing in unison like that... don't their legs get tired? My brain...!" Uhm... I'm going to... uh... I'll leave you to it. 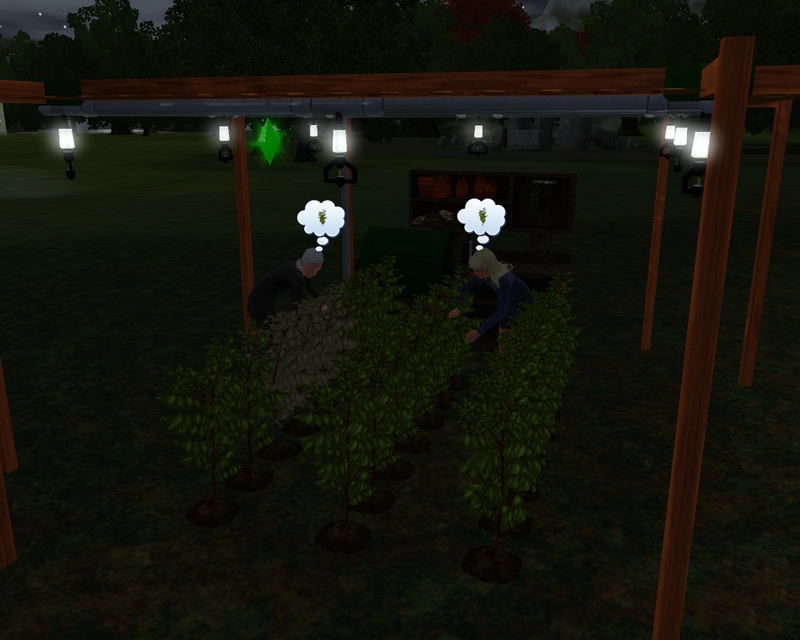 Bradan and Izzy have been working together to make sure Ara's garden is still being harvested while Ara is being brainwashed insuring a potential heir. 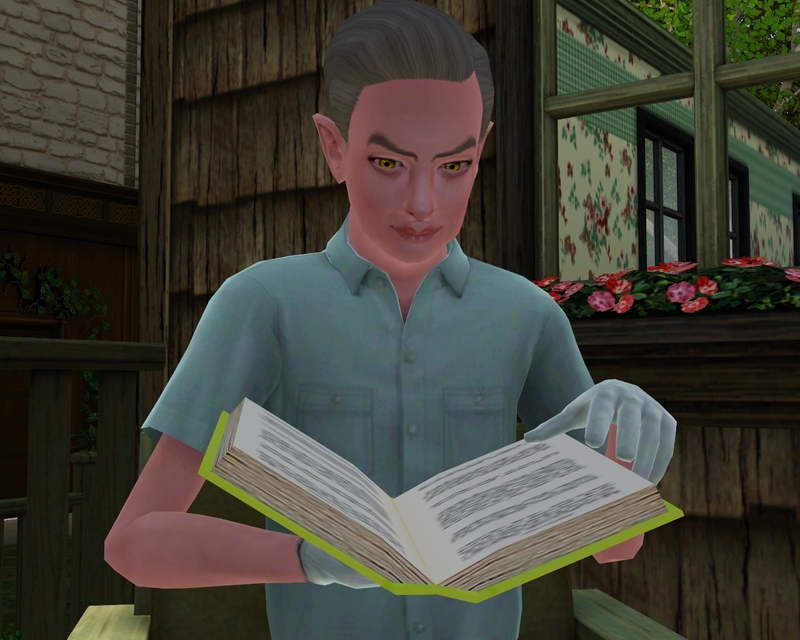 While Bradan wasn't in the garden doing things for his wife, he was actually keeping her company. "Hey there sweetcheeks, did I ever tell you about my winning game that made me a superstar athlete?" "Yes, you old man, just about a hundred thousand times. I think I'd rather watch another loop of this kids program before I hear you tell that story again." "What? You want to hear it again? Ok!" Bradan gave a wily smile. 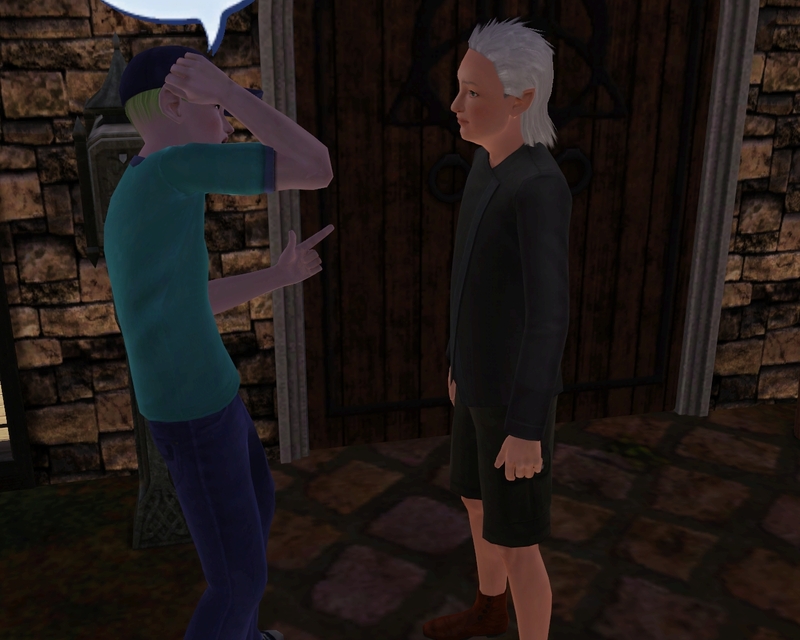 "Don't test me you senile old coot." "Oh, don't pretend you don't like it, it's not a secret anymore sweetcheeks. Hey, are you getting fatter or is that just me?" "You don't remember my pregnancy? The one we tried for last night?" "You did what now? Sorry, I was tuning you out for a moment." "That's nice dear, why don't you come and sit by me now?" "I love you too." Bradan got up and walked to the other side of the room. "What are you up to now old man?" Ara called. Yeah, what are you up to Bradan? Plan D? Why don't I know about Plan D? What IS Plan D even? "Plan D is for if I am still unable to provide an heir for Ara. I have a lot of friends, ones with skin traits that you're looking for that would ensure Ara could carry on." You're planning to have her have children with someone else if this pregnancy fails? "I hope you realize that I won't live forever, right?" 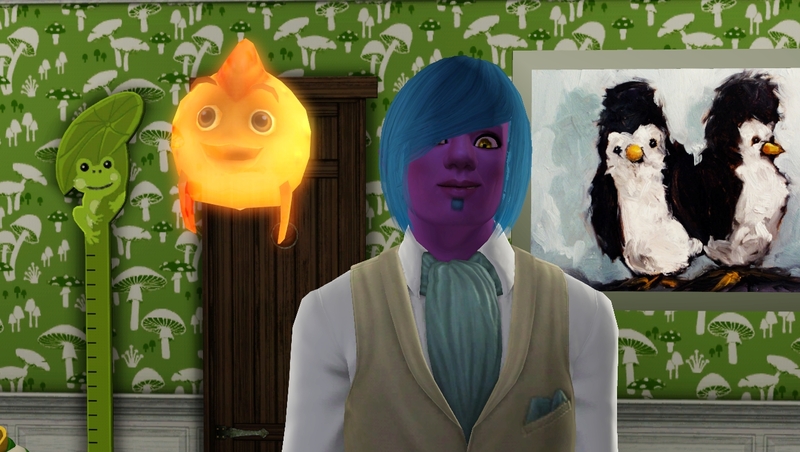 Yes, I'm aware of a sim's life-span, I keep tabs on everyones daily. Are you sure you aren't falling in love with Ara? It wasn't long before the newly single by story-progression Breandan O'Shea arrived at the door. Breandan, that's who you had in mind for Ara? "Well, she could've gone after one of my married friends, but I'm sure you don't want to set that as a precedent for your project." Breandan made an interesting entrance. 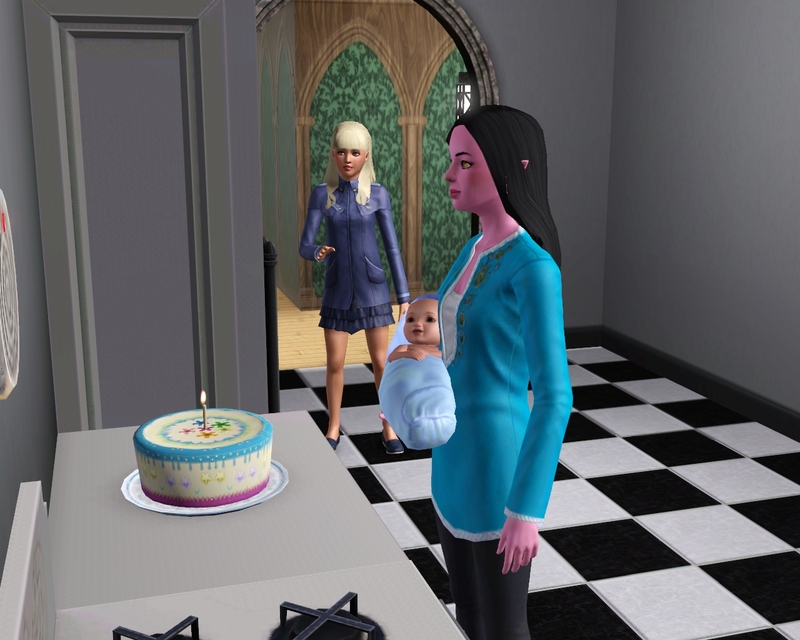 Ara took a little bit of time to get to know Breandan, but she was still highly unsure how ok she felt with Plan D.
In order to get her mind off of the importance of having an heir soon, she took her son Aiden to the cake to become a sweet, adorable toddler. Ohmigosh isn't he so adorable?! After taking Aiden to the cake and spending a little more time being brainwashed watching educational TV with bunnies and dancing lobsters, Ara needed to head to the Consignment store to ensure she made it to level 10 gardening. 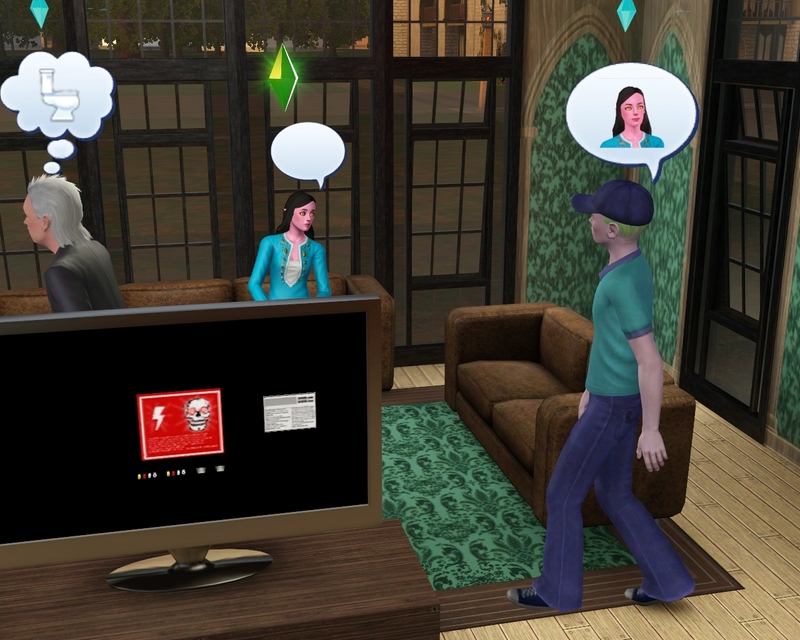 Funny surprise waiting for her there was her biological father from another realm. She could only smile and nod at him, though he was probably creeped out as to why a girl who looks very similar to him in almost every way is smiling and nodding at him. Then again, he is old, so maybe he's senile like Bradan. On another birthday note, the next day was Tessa and Izzy's birthday. 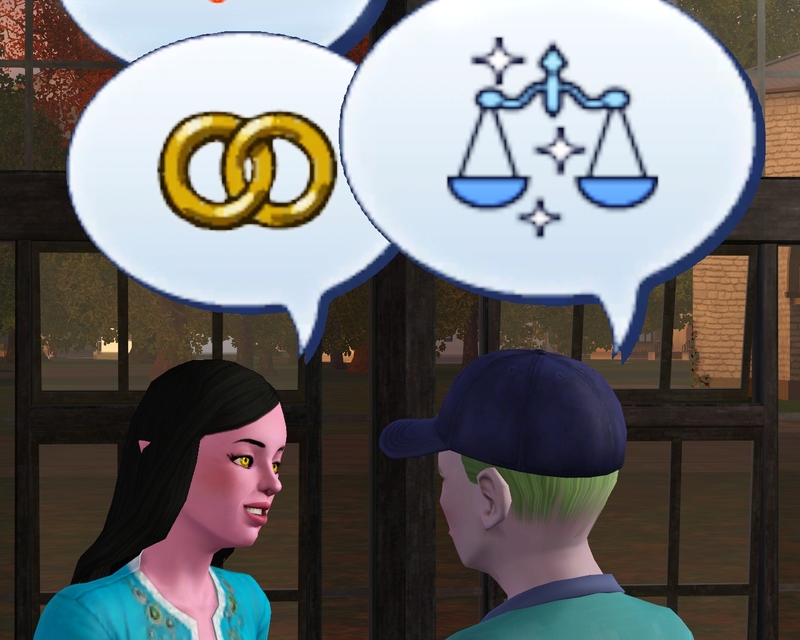 Izzy was becoming a young adult and joining the real world. 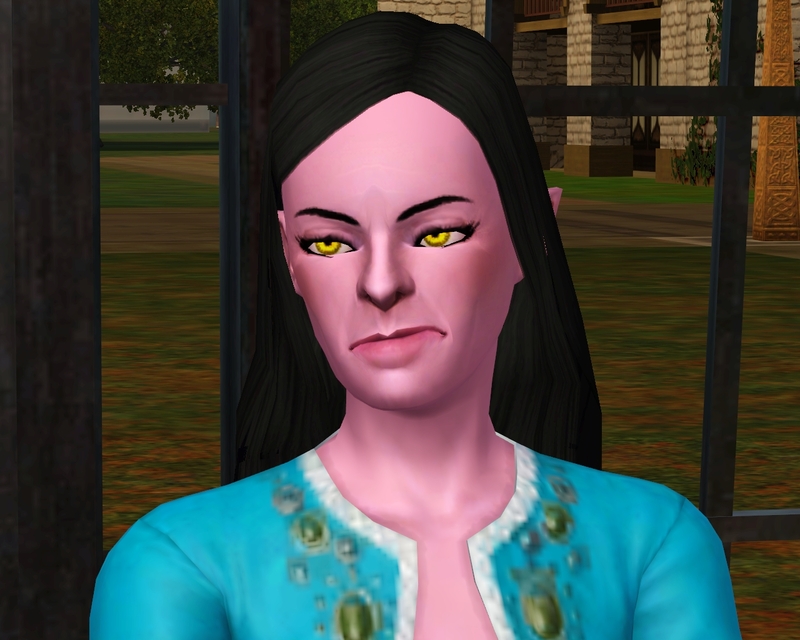 Tessa on the other hand, was just becoming a snobby, brattish teenager. Meant in the nicest way possible, dear. Erm, well, oh look! Izzy is aging up! Let's go watch! Yay! Izzy! Woo! Were you saying something dear? 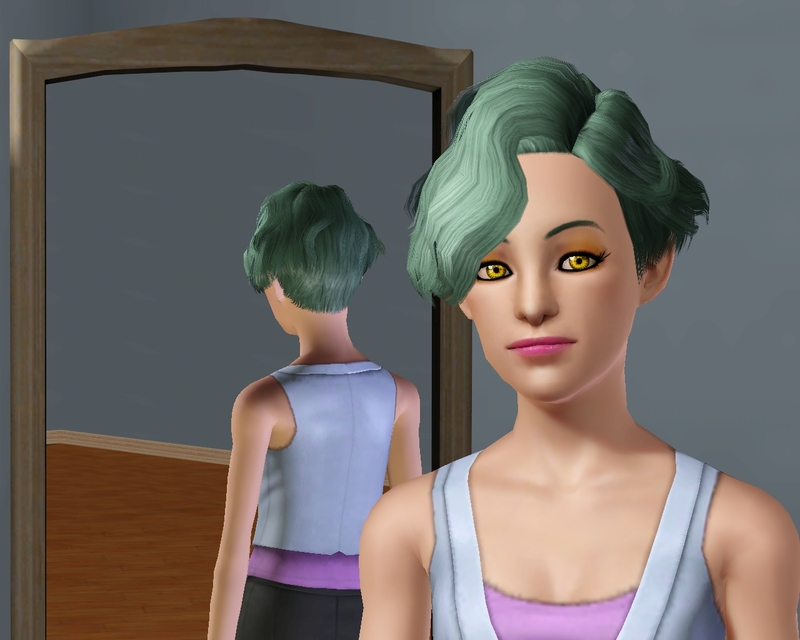 So Izzy aged up and gained the Handy trait to add to: Family Oriented, Loves the Cold, Heavy Sleeper and Lucky. She chooses to be a Mad Scientist as her Lifetime Wish... which I'm not sure if we'll be able to do that considering she has no skills in any of the required fields, but it sure beat all the other options! "Gee, thanks for your vote of confidence." Well, we'll give it a try, no? Just don't stop painting. Izzy's voice lowered in a mocking tone she grumbled: "Izzy do this. Izzy do that. Izzy paint more pictures. Izzy go help garden. Izzy go make another portrait." You know what, I'm going to see how Tessa is doing with her birthday and you can stand in a corner all by yourself... AND PAINT. On another note, Tessa aged up to be a gorgeous teenager with striking features. She gained the Natural Cook trait to add to Grumpy, Loner, and Snob. "Now that's what I'm talking about." Tessa fluffed her hair. I pity the fool who marries you. "I'm sorry, did you say something? I was admiring myself." You know, I think you should tell your dad how great you look. He's a great listener for those kinds of things. Hey, who let you out of your corner?! "Oh, who's a cute nooboo? You are! Yes you are!" 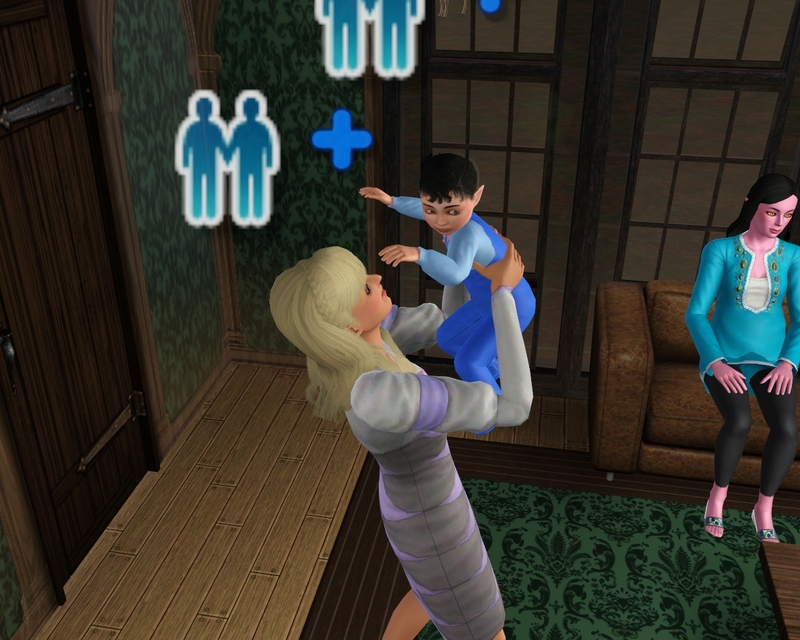 Well, at least someone takes care of poor Aiden. Ara looked up from the TV: "Who's Aiden? Is he a dancing bunny too? We must give our children to the bunnies. They make children happy. They all dance. Dancing happy, happy bunnies." 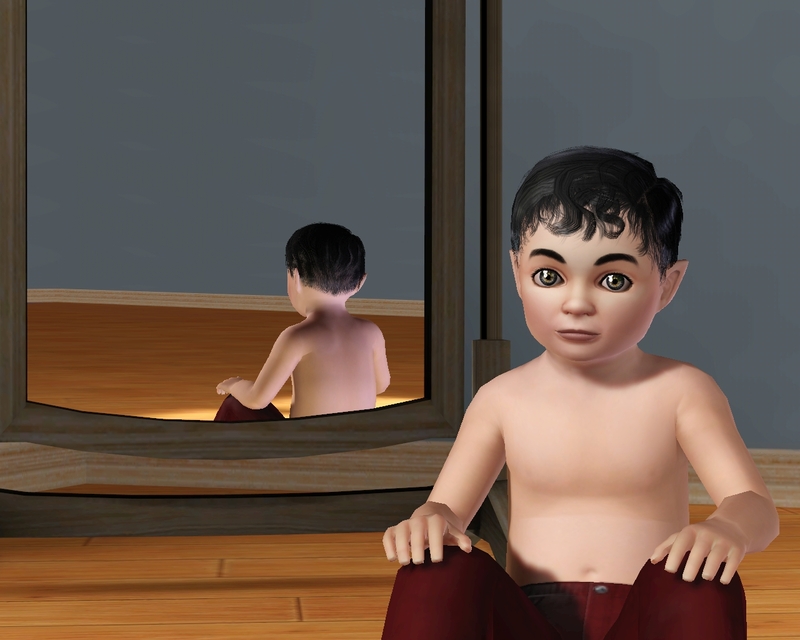 Uh, Iz, why don't you take Aiden to his crib... and lock the door. Izzy nodded. "Right away." 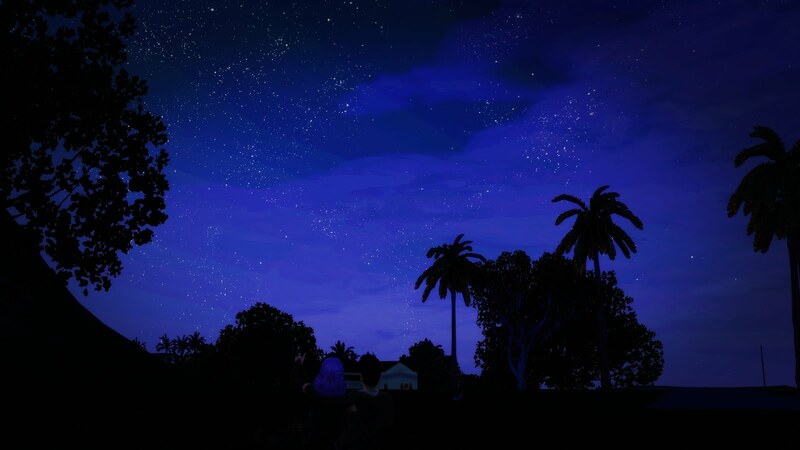 She took Aiden and scrambled back to the nursery while Ara smiled and looked back at the TV. 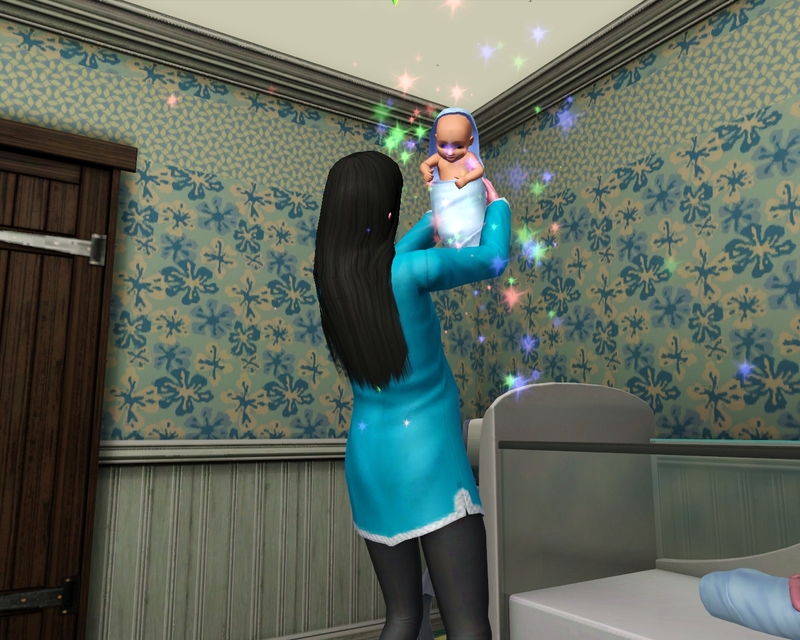 Thankfully, for everyone in the house, Ara went into labor. Please, please, please be a rainboo! "Wow, nothing like a little painful labor to rip you right out of a horrifying brainwashing experience. Thanks for all your help there, watcher." "I was being sarcastic - OW!" 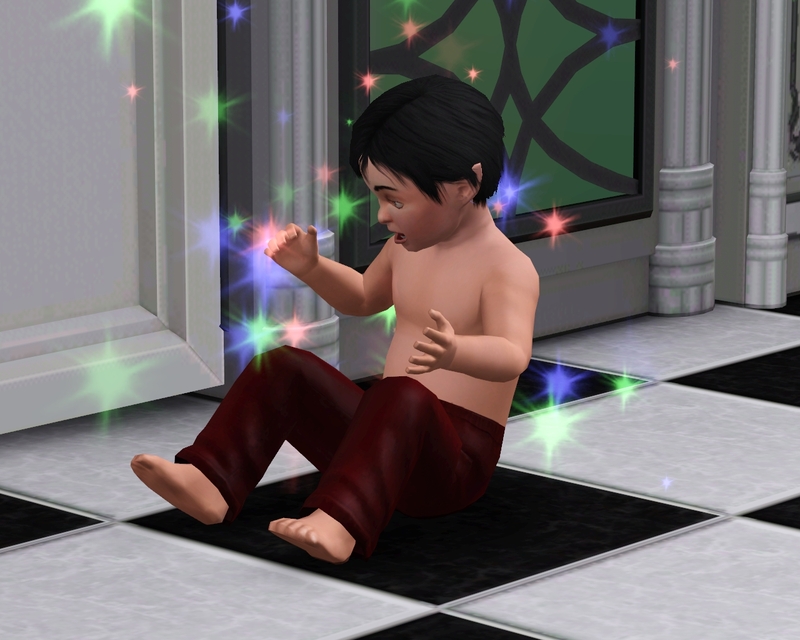 The sparkles hit and we have two baby boys! Dekit and Sam. Dekit is a Loner and Loves the Cold while Sam is a Genius and Easily Impressed. Ladies and Gentlemen, I can finally chill out. "Oh, look at my little rainboo! Hi there little Sam! You almost gave mommy a scare your color is so close to human skin...! Thank you for saving mommy from having to have kids with another man besides daddy!" I thought you would've been happy to get away from your husband, Ara? Ara smiled widely, "Breandan was nice, but if I ended up with him I would have no one to make fun of who would take it so well." Of course not, you two are quite the pair, aren't you? Anyways, time to show the nice reader's that picture of you giving birth to your other son and call it a night. "Do I have to go back to watching TV?" You get to go back to gardening almost 24/7! "And all my dreams are dead." Ara sighed.